So now things are starting to get really interesting in here! 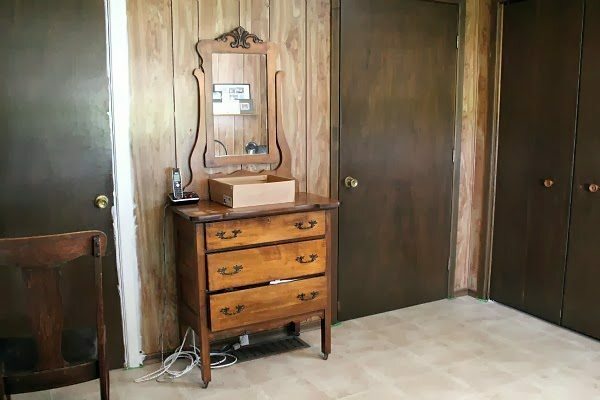 Just for fun, let’s have a look at where we started in this master bedroom. I know. It was bad, right? And with no major renovations or installations, just paint and some pretty stuff, here’s how it’s looking today! 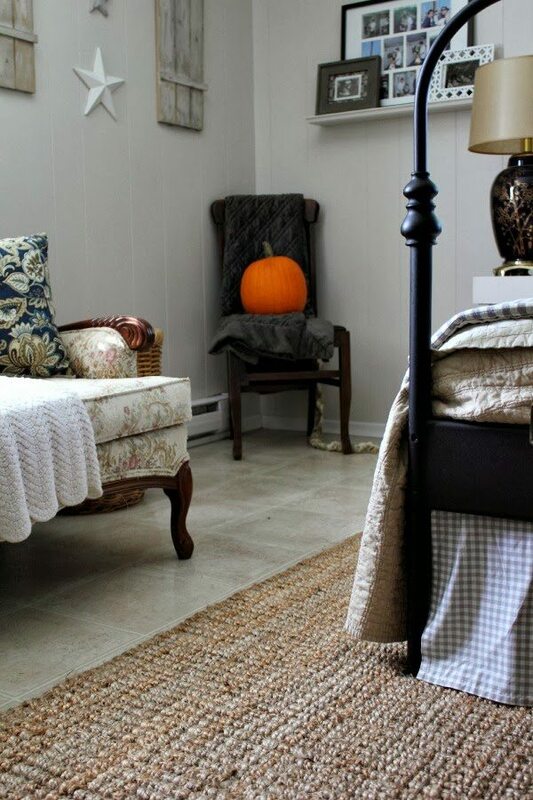 This little room re-do has been totally in the spirit of “just for now” so I can enjoy it and not pull my hair out while I’m waiting for us to be able to do some of the more major renos we’d like to do eventually. I’ve been trying to do it using things that I can keep and continue to use and love later on down the road as well. I’m not done yet, but it’s already had much more of an impact on my daily enjoyment of my home than I ever thought it would. The first thing I did that really made an impact was to paint out every single ugly dark brown surface in the room. That obviously completely changed the feel of the place. The other huge, major, monumental change came with the rug. Even though the vinyl flooring in here is very neutral, it still feels so so so good to just cover up a good portion of it with this beautiful rug of my dreams. I’ve been looking at different area rugs for the last year or so and I’ve been really disappointed by what I’ve been finding. I thought what I wanted was pretty simple and basic, but I guess it turns out I’m a little more picky than I knew I was. I’m so glad to say that this one came to live with me just at the right time. Right when I was ready for it! This is exactly what I had in mind. 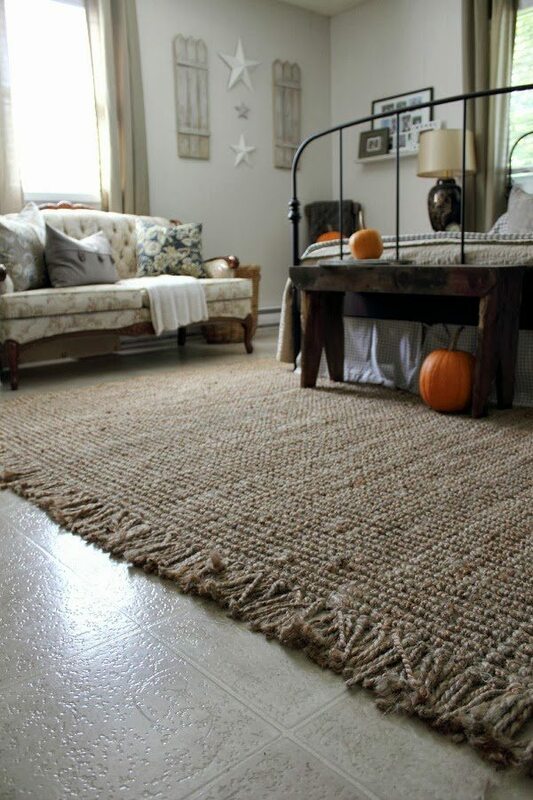 The Maui Chunky Loop Rug in beige from Rugs USA. Perfect. I guess it’s just one of my (many) quirks, but it gives me great satisfaction to see my new bedding up against this happy new rug instead of the old vinyl flooring. For now, this happy little setting is just not something I can find anything to complain about. Especially now that I finally got Chris to move the exercise bike out of the corner and into the basement! I know some of you might be a little concerned about having a 100% jute rug in the bedroom, so let me just put your mind at ease. I was surprised to find out that it’s really not that rough at all to walk on. In fact, it’s really kind of a nice foot massage with the chunky loop design of this one. And with two cats and a dog, no one has been the least bit interested in scratching it, playing with it, or causing it any harm. They’re just sticking to the bed as usual. 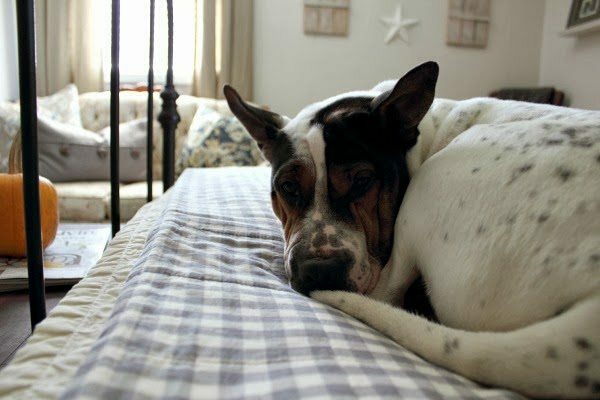 Hey, if they’re going to be all over the bed and the furniture, at least they look good doing it! Thank you so much to Rugs USA for providing this very important part of the master bedroom re-do. 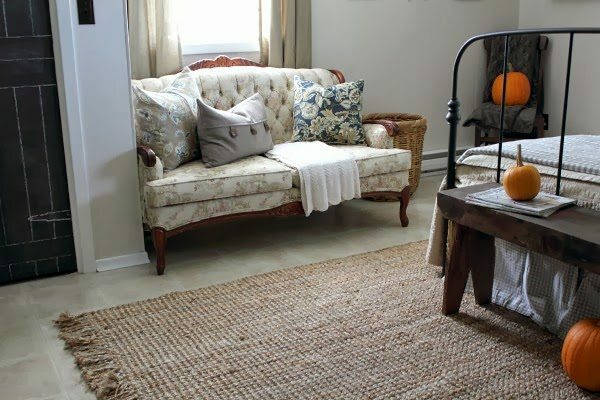 It really just would not have been able to come together quite as nicely without that rug! If you’d like to get to know Rugs USA a little more as well, you can follow them on Facebook, Twitter, and Pinterest! Coming up soon (I hope! ): A new bedside table to replace the little white one and some fun projects in the corner where the bassinet will go once the new baby boy gets here! Oh how pretty! Everything fits together beautifully, great job!! I can’t believe how you have changed this room! Truly amazing, Courtenay. The paint, the awesome rug, and that adorable little settee under the window…this room has taken on quite the transformation, you’ve got mad skillz, girl! Courtenay … I doesn’t look like a “just for now” renovation … it looks fabulous. Oh I’m loving that rug! It looks so luxurious, and it fits perfectly in with the decor in that room! Just beautiful! Love this room. 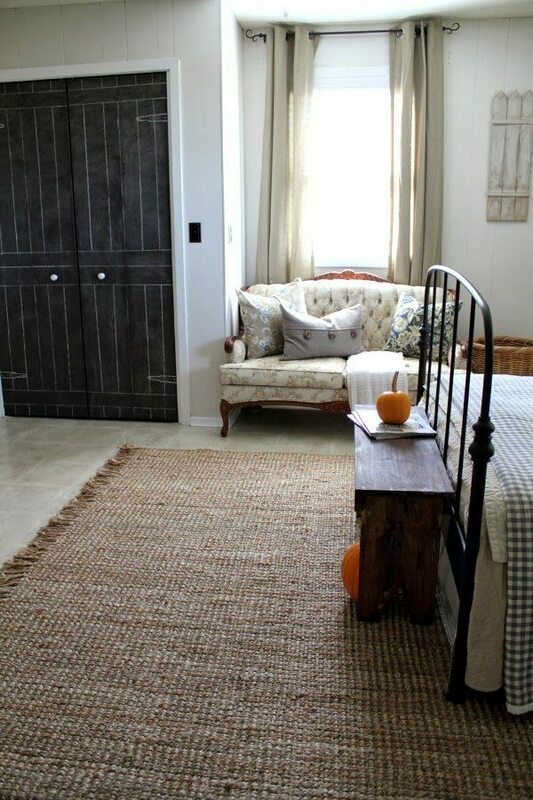 That rug is such a perfect fit – the texture and the color is just right! Love seeing how you have pulled everything together! I LOVE that rug!!!!! It looks fantastic!! 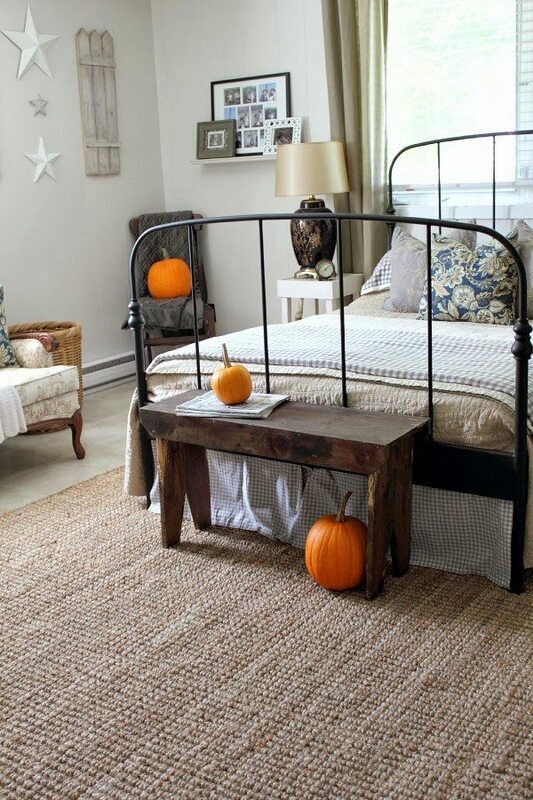 Adds so much texture to the room! Amazing how the white paint totally tr anformed the room. The paint made it look vibrant. WOW, that looks fantastic! I love your room, so pretty! Cute dog too. Besides the whole country look, which is warm and inviting and so well put together, I love the affect you did on the doors. Very original and creative. Way to think outside the box! 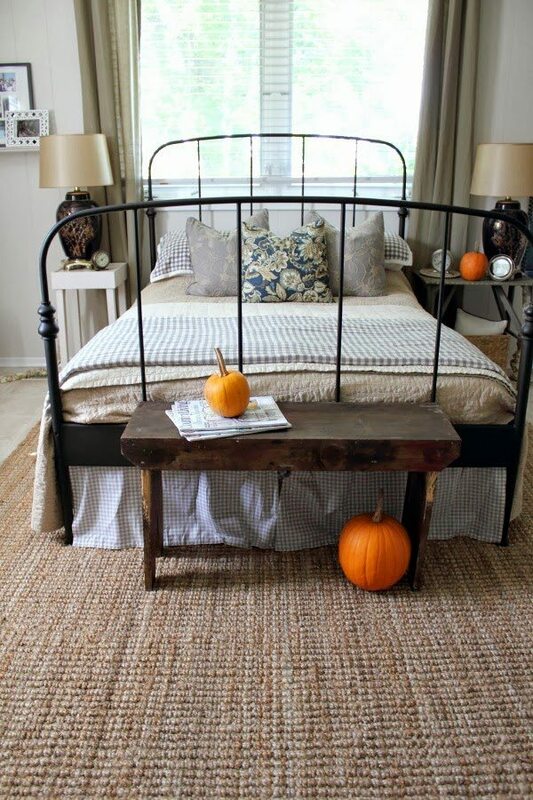 Gorgeous – the rug adds great texture! Wow…love it all…especially the closet doors!! Perfect!! Love the tassels on it. 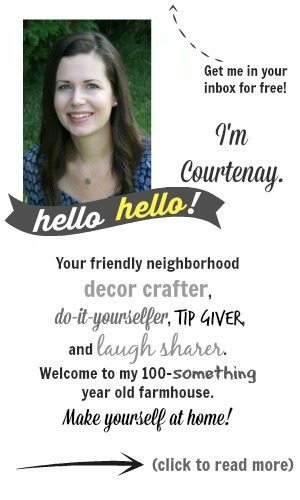 I love your bedroom Courtenay! The room really looks beautiful! Great transformation! On the master bedroom. All I can say is Yikes! Then WOW! WOW! WOW!. Very soothing. reminds me of hot chocolate and daffodils. My husband and I are on our second renovater and stupidly I didnt take before pictures because I didn’t realize what i could do. I quit my job, got it up and running then gradually went back to work. It’s been 8 years and we are 6 weeks away from full renovation completed. All cost out of pocket. bought it for $80,000 now appraised at $148,000. I need advice on taking pics, lighting and starting a blog. Thanks Leann. These area rugs are looking beautiful. HI! I just bought this rug then found your blog. You made the room incredible! How do you like the rug? I hope you still like it! What a beautiful transformation! Thank you for the rug information. I am looking for one like this myself. I love ur room! 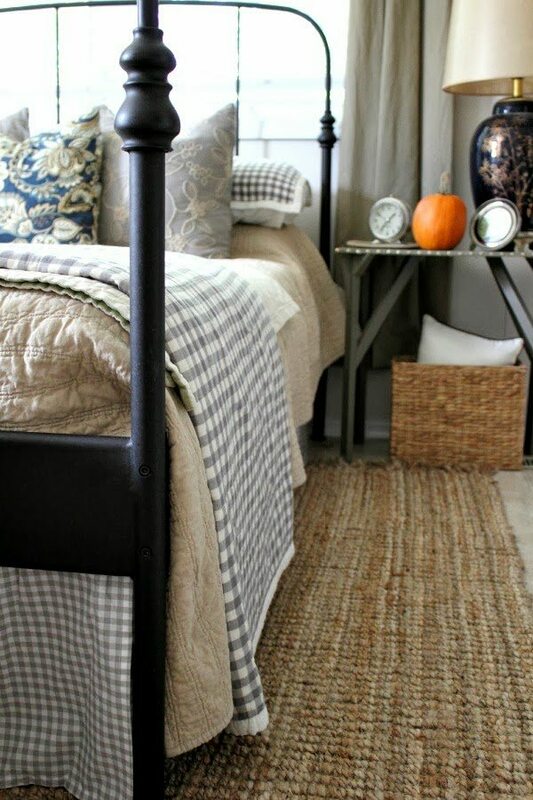 Especially the grey plaid bedding! May I ask where you got it? I am looking for the same bed. Can you tell me where you got it? OR the name & brand name. 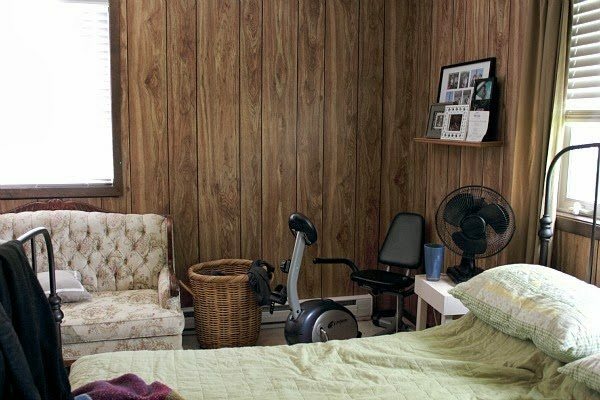 And does it need a boxspring or does it have the slats. Love all the beautiful work …. very peaceful & beautiful. Thanks Blessings! The bed is from Ikea! I don’t think they sell that exact one anymore, but I’m pretty sure they have something similar. It was less than $200 and I’ve gotten so many compliments on it over the years! What was the original name of the bed. They have so many. Love that bed also looking for one. WHEN year DID YOU BUY IT? Thanks! Stunning transformation! Would you mind sharing the wall paint colour? Many thanks. Thanks so much, Andrea! The paint color is Martha Stewart Whetstone Gray! Your bed was bought at IKEA in the US? Or what country? What was the name of the bed? Thanks! It was IKEA in Canada, but I think they carried it in the US as well. I don’t remember the name, but I do know that they don’t carry it anymore unfortunately. We bought ours about 6 or 7 years ago now. 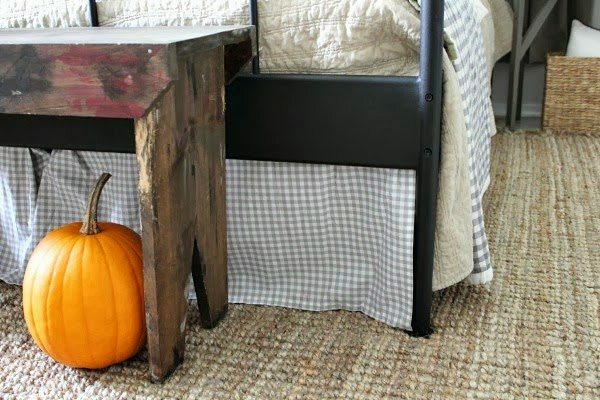 I think they have a new style of traditional-looking metal bed frame now though which is also really nice! Good luck on your search! 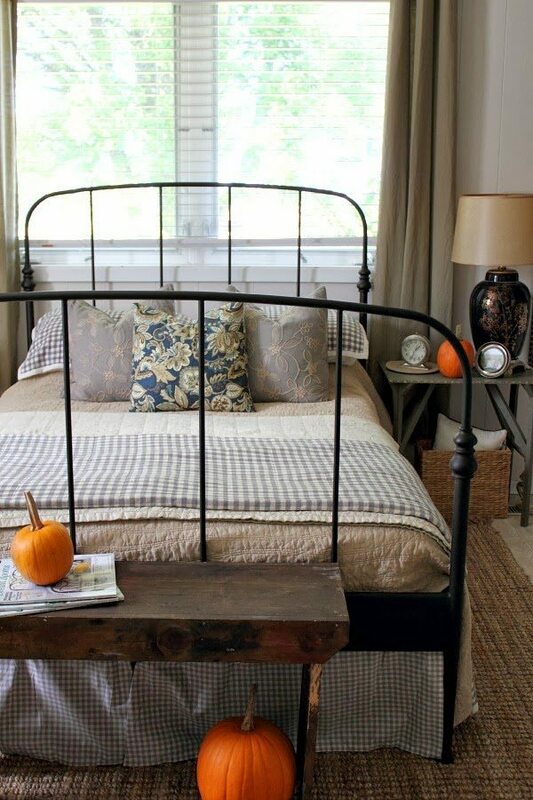 You may be able to find this bed frame second hand on ebay or something too because I know it was really popular! Yeah not sure that their new ones are quite that original… I will look again. Thanks! Gorgeous! Feeling very inspired. 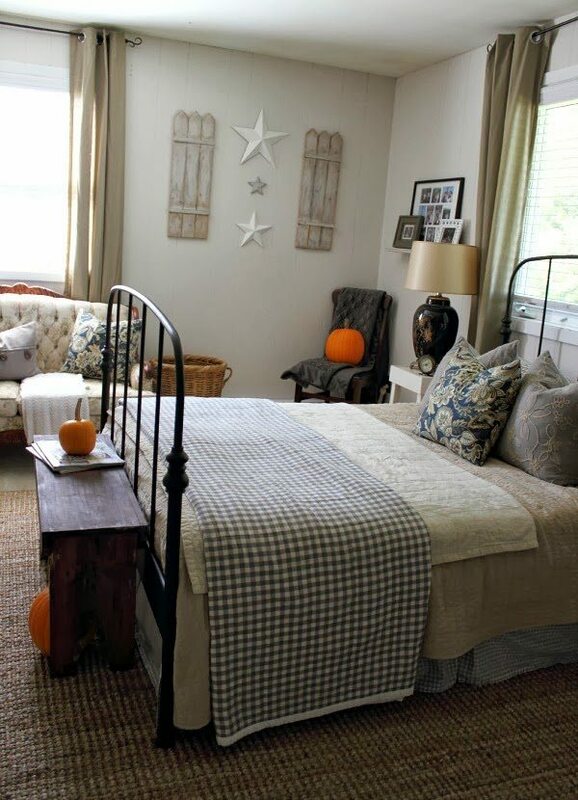 Where do you get your throw pillows on the bed? Super cute! Thanks so much, Jen! The grey ones are from Home Goods and I made the blue one! Where did you get all of your bedding? I know it was a while ago, but I can’t find anything anywhere close to it! Love your changes! I also enjoy finding others like my husband and me who enjoy their pets no matter where they may want to hang out…on the rug, the bed, etc.